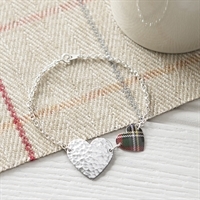 Our best-selling Hearts Jewellery Collection made in a variety of tartan prints. We use toffee, shortbread, tea and cake tins of all shapes & sizes to make these pieces! A smaller double heart slim heart necklace handmade in tartan print shown on left. 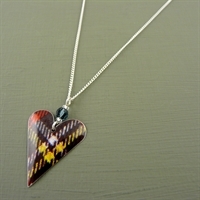 A larger double slim heart necklace handmade in tartan print. Shown on right. Two hearts side by side handmade in tartan print and hammered aluminium. Medium double heart earrings on short earwires, handmade in tartan print and hammered aluminium. Dainty double round heart studs handmade in tartan print and hammered aluminium. A gorgeous statement two hearts bracelet handmade in our tartan tin. 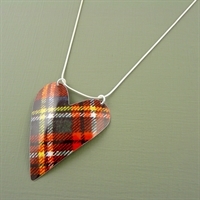 A large heart pendant hand-made in tartan tin, one of our most popular pieces! 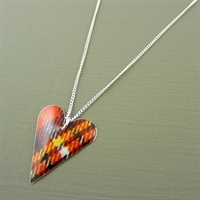 A medium-sized slim heart necklace handmade in tartan print. 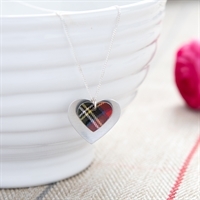 A slim heart necklace with sparkling Swarovski crystal, handmade in a tartan prints. Slim heart necklace handmade in tartan print. A small round heart necklace with sparkling Swarovski crystal, handmade in tartan prints. A small round heart necklace with sparkling Swarovski crystal, handmade in green tartan prints. 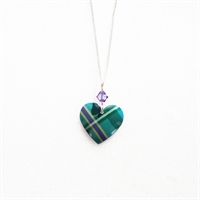 A medium-sized slim heart necklace handmade in green tartan print. Medium heart earrings on short earwires, handmade in tartan print. Heart-shaped earrings handmade in tartan tin with a sparkling Swarovski crystal. Medium heart earrings on long earwires, handmade in tartan print.